Anybody who is admitted behind the barriers of the Hanford, Wash. plutonium works is likely to witness the incongruous sight above. Under the cold eye of security guards, technicians are happily dragging around toy wagons loaded with “hot” chemicals. This is not furtively snatched diversion. Toys, the scientists feel, are often better than expensive specially designed machinery for transporting chemicals too radioactive to be carried by hand from one laboratory to the next. 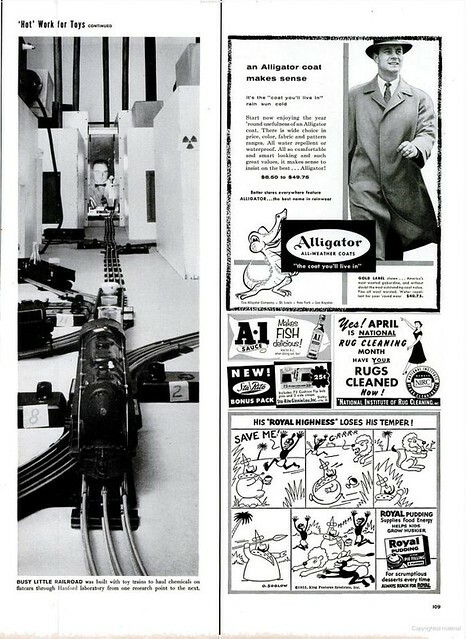 But the toy which really makes every scientist’s eyes light up is an electric train which faithfully winds its way through a labyrinth of equipment hauling a payload of radioactive chemicals. 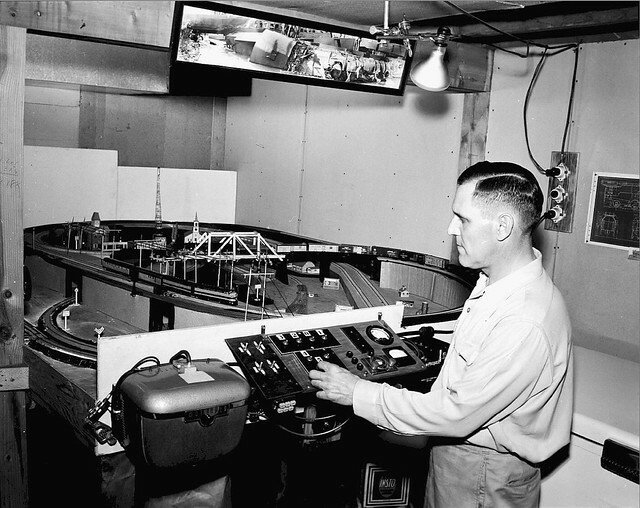 BUSY LITTLE RAILROAD was built with toy trains to haul chemicals on flatcars through Hanford laboratory from one research point to the next. I was hoping in the Hanford Document Retrieval System to find something on prep for this article and approval of the images but have come up with nothing. 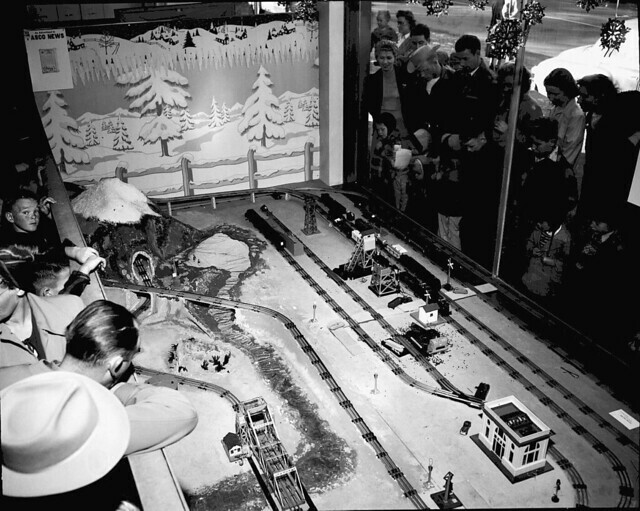 I’ve not yet come across pictures of the use of toy trains at Hanford, so, I thought I’d put in here one of a couple of toy train images I did find in the archive, of potential Christmas customer ogling a toy train set-up in the store window of Griggs in Pasco. My guess is the date is about 1950. Oh, wait, wait, I find images of this train hobbyist as well. That’s some elaborate train guidance system, isn’t it? Even schematics on the wall over there. 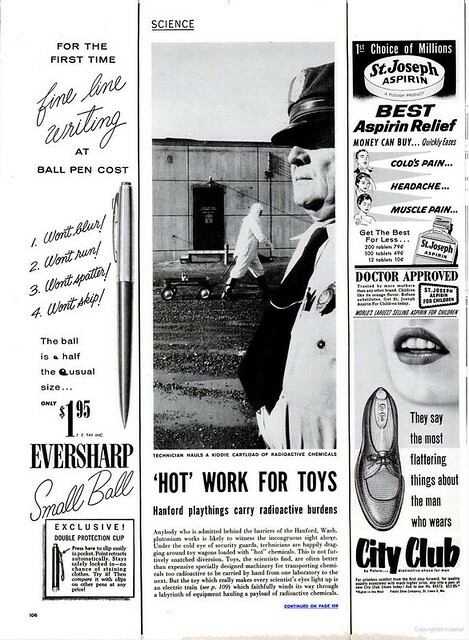 I’m wondering if we have here the nativity of the toy railroad car delivery system at Hanford. If maybe this hobbyist may have been responsible? 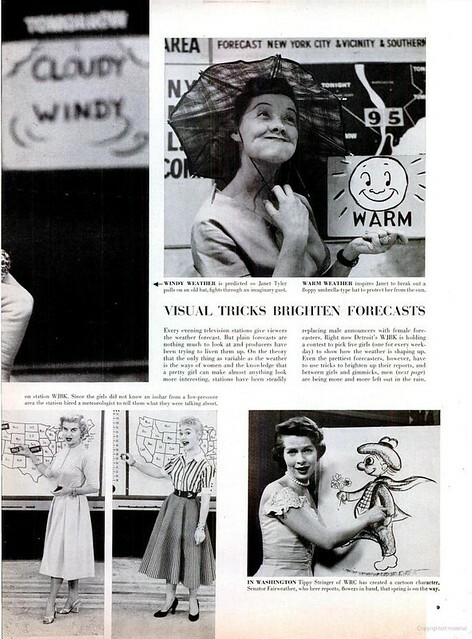 As a little supplement, here’s one of the other things readers of Life were offered in this particular issue–the rise of the Weather Girl, because viewers responded to eye candy and eye candy that would go comic and mug it up for the camera. 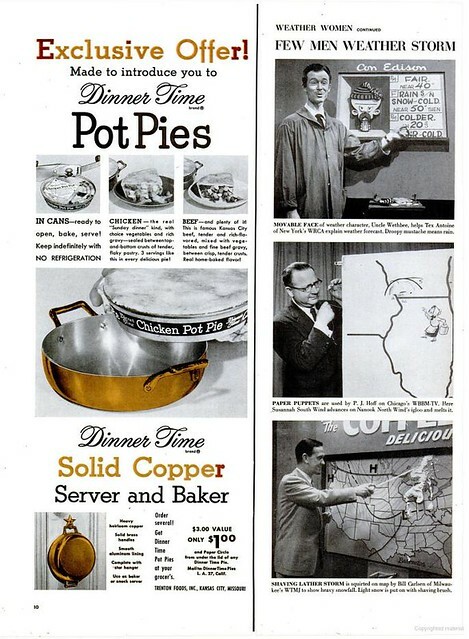 And whether (pun) or not they found canned pot pies appetizing, I don’t know, there’s an ad down there for them. I’d never heard of canned pot pie before, and have a difficult time imagining canned pot pie pastry wearing well. 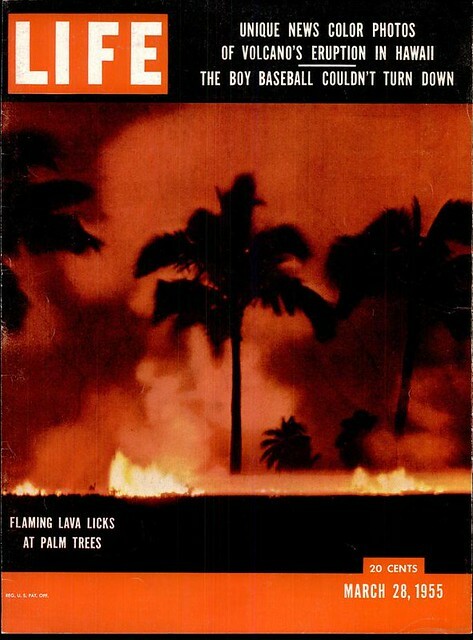 These Life images are designated public domain non-commercial use, provided by Google Books. In 1987 I was approached by an engineer at Boeing by the name of John Rootsie. Hearing I was a train collector, John offered me a train set that his Father (An Electrical Engineer from Hanford) had given him back in the 50’s. He said that his father had brought the train home from Hanford as they no longer had a need for it for transporting and un-loading radio active materials in their labratories. I thought it was a joke until I read an issue of Model Trains from Kalmbach. 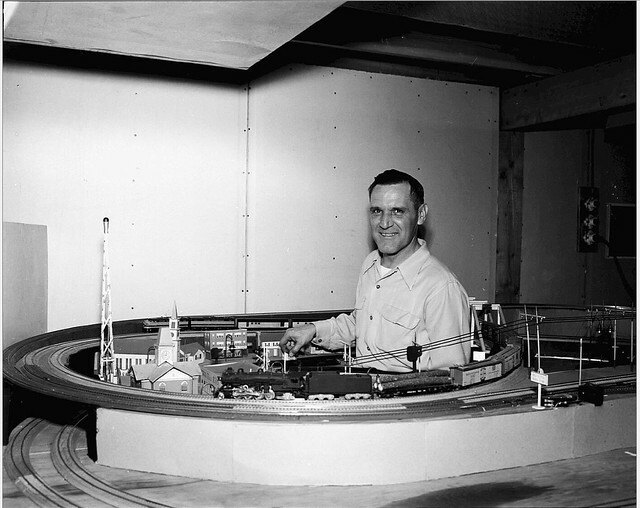 The Issue contained an article on trains at Hanford, and low and behold a picture of the train set I had been given from John was contained in the article. It even showed the dump car they would load and dump out the loads in their labratory. I have never had the train, (which is mostly metal) tested with a geiger counter, but based on Johns story, which was unsolicited, the fact that they lived in the TRI cities during that period of time , and that his father was one of the participating engineers, I have a strong feeling that the train, train track, and accessories that came with the set in old apple boxes are the real McCoy. I keep it on a high up display shelf and some day when I find a geiger counter will see if it is indeed a Hot Toy Train used during the cold war efforts at Hanford. If not, it is still a beautiful piece of Lionel History. Why in the world would he have brought it home, though, if it was hot?? I mean it sounds legit because that’s not the kind of story you make up. It’s too wonky. If you’re ever interested, something like The Reach Museum (never been to it) might be interested in hearing about it.